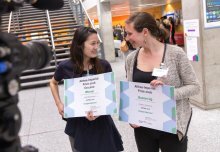 A leak proof, biodegradable and organic menstrual pad design has won the top prize in Imperial's pioneering entrepreneurial programme for women. 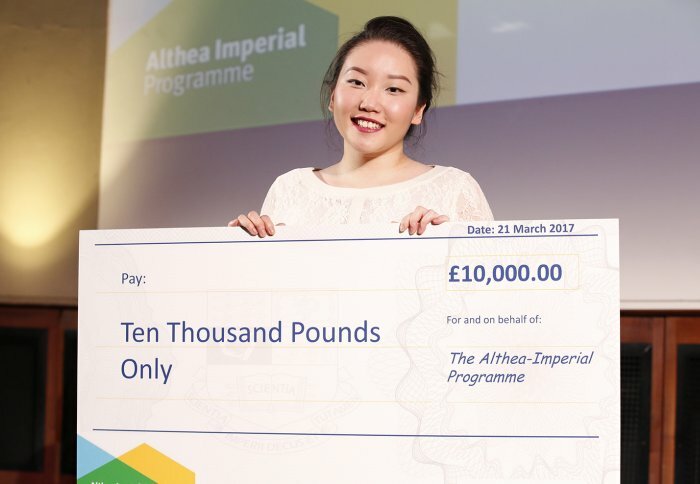 Olivia Ahn, a final year medical student, took home £10,000 of funding at the finale of the Althea-Imperial Programme last night. The Althea-Imperial Programme is a unique collaboration between Imperial and the Althea Foundation, a social venture fund. Now in its third year, the initiative is designed to inspire a new generation of women in science, technology and business. Olivia’s start-up, WithLula, aims to re-think the way menstrual pads are designed and provide unique support for women during their periods through a machine-learning app. The pads are entirely leak proof, biodegradable, organic and would be considerably cheaper to the consumer than other products on the market. Taking inspiration from the way flower petals redirect water on their surface, the WithLula pads use a layered structure to send liquid into the central highly-absorbent core and away from the edges of the pad. “As a medical student I’d not really done anything entrepreneurial before. Going into Althea really blew the doors open. The plant-based, ethically sourced materials have been tested and chosen for their sustainability and absorbency properties. The night-time pads designed by Olivia can absorb up to 30ml. The average woman loses 30-40ml throughout one entire period. Olivia said: “Initially I wanted to solve the issue of waste. 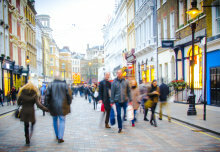 Over 200,000 tons of sanitary waste is produced in the UK each year. The pads work in unison with specially designed underwear which is fitted with a medical grade silicone membrane. This contours to the body and stretches – giving comfortable support for pads, and designed to better fit the female form. The underwear is also absorbent for the days before and after a period, when spotting is common, removing the need for a pantyliner. By Women. For Women. Period. requirements. The app uses machine learning to better predict the frequency and duration of their period and predict their needs. The required pads are then delivered to their door. Olivia beat off competition from four other candidates to secure the top prize, after they all pitched their ideas to a panel of industry and business experts including Kate Bingham, Managing Partner, SV Life Sciences; Erin Platts, Head of Commercial Banking, Silicon Valley Bank; Professor Sir Mark Walport, Chief Scientific Adviser and Head of Office for Science, HM Government and Victoria Turk, Technology Editor, New Scientist. A second prize of £6000 was awarded to Ana Luisa Neves (Surgery and Cancer) for her project Momoby, a revolutionary finger prick test that will bring prenatal care to pregnant women living in isolated areas in developing countries. The third place prize of £4000 went to Toni Semmence (Chemistry) of Sensidex, a compact and easy to use device which allows commercial kitchens to test food for the 14 most common food allergens. Speaking at the event, Professor Alice Gast said: “Our impressive finalists tonight come from medicine, engineering and natural science. 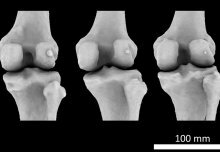 What I love about their projects is that they are aimed at solving fascinating and important problems. “Programmes like Althea-Imperial are part of Imperial’s strategy to embed our educational experience in a vibrant, research-led and entrepreneurial environment. A compact and easy to use device which allows commercial kitchens to test food for the 14 most common food allergens. C-Brest is a solution for a portable, fast and painless early breast cancer detection service. Genetically engineering dirt-eating bacteria to save the world from heinous carcinogen-use in the dry-cleaning industry. A revolutionary fingerprick test that will finally bring prenatal care to pregnant women living in isolated areas, where the need is most prevalent. Leakproof, comfortable, biodegradable hygiene products designed with biomimicry delivered straight to your door.